02:26 — Doctor Who: Writers for New Series, Season 5 officially announced. 06:51 — Outcasts: New BBC One ‘space drama’. 08:30 — Spider-man: Teenage reboot for film series. 11:57 — Edge of Darkness: Hollywood turns another classic BBC Series into a film. 13:51 — Firefly: New TV series tie-in book. 32:50 – Doctor Who: That Brown Trouser Moment. 79:37 – Farewell for this podcast! 80:04 — End theme, disclaimer, copyright, etc. Wikipedia: Edge of Darkness (film). Titan Books: Firefly – Still Flying. 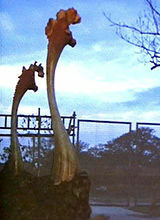 Wikipedia: The Day of the Triffids. BBC: The Day of the Triffids (2009). This Week in Doctor Who. 02:34 — Doctor Who: UK ratings for The End of Time. 04:42 — Syfy renewing Stargate Universe and Sanctuary. 06:51 — Peter Jackson is developing a film based on the Mortal Engines books. 08:48 — Doctor Who RPG: It is out! 11:02 — Star Trek wetsuits – the Red Shirts of the deep. 12:41 — How wrong we were: Predictions for 2009. 18:01 — How wrong we were: Hopes and Dreams for 2009. 22:14 — Predictions for 2010. 28:22 — Hopes and Dreams for 2010. 31:15 — Fears for 2010. 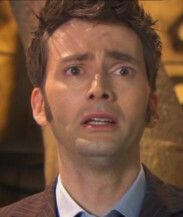 34:47 – Doctor Who: The End of Time. 89:45 – SFX Weekender announcement and win FREE TICKETS! 93:13 – Farewell for this podcast! 93:45 — End theme, disclaimer, copyright, etc. 95:30 — Christmas greetings from other podcasts. DEADLINE: Friday 15th January 2010. The Doctor Who Podcast Alliance (that Staggering Stories is proud to be a member of) has organised, in conjunction with SFX Magazine, free tickets to the SFX Weekender convention, on the 5th/6th February 2010, Camber Sands (Pontins Holiday Camp! ), East Sussex, England. Guests include Tom Baker, Elisabeth Sladen, Gareth David-Lloyd, Toby Hadoke, Paul Cornell, James Masters, Mac McDonald, Dave Gibbons, Robert Rankin and many more. 50 sets of up to 4 tickets are to be given away, all you have to do is phone in, quote a code and cross your fingers (if more than 50 people apply before the deadline of 15th Jan 2010 then names will be drawn from a hat).